On Tuesday evening I had the pleasure of spending four hours in the company of the leader of Manchester City Council. Sir Richard Leese joined fifteen Downtown members at an exclusive private dinner at the Abode Hotel to discuss devolution, business growth, MIPIM and the current political landscape, among a wide ranging debate and discussion. It was a fascinating insight into the thoughts and ideas of a man who has now led his city for an incredible nineteen years, leading a crusade for a city region model of governance that has led to Greater Manchester being at the centre of one the governments’ flagship policies, the Northern Powerhouse. Leese was quick to dismiss criticism of other city regions who are not as far down the road as Manchester as far as the devolution agenda is concerned, pointing out that for his city this has been a mission that began over twenty years ago. With the best will in the world, places like Liverpool, Birmingham and Leeds cannot do in twelve months what he and his colleagues have taken two decades to deliver. On a positive note for his neighbouring city located at the other end of the M62, he suggested that it was hard to imagine a Northern Powerhouse without Liverpool in it. He also believes Leeds are close to doing a ‘devo deal’. Ultimately though, what does the Northern Powerhouse mean? In simple terms, says Leese, it is a city of ten million people, which has a wonderful diversity that boasts quality industry, entrepreneurship, culture and a tourist offer in equal measure. In practical terms, it’s about ‘the economy stupid’ with much improved infrastructure and connectivity (both in terms of digital and transport links), and an opportunity to invest in knowledge and skills that will give northerners a better life chance. Sir Richard was also candid in his answers on a range of other topical issues. On the EU he is pro and believes the British people will vote to stay in; on Jeremy Corbyn, he has a duty as a local Labour leader to support the national Labour leader; MIPIM was in danger of turning into a p**s up in the early noughties, but has got back on track – and it may be worth considering a Northern Powerhouse stand at the property festival at some point in the future; and George Osborne is an astute politician who is genuine in his drive to re-balance the UK economy, though his austerity programme is unfair and wrong. A great evening with an impressive leader who is delivering for his city – and for the north. 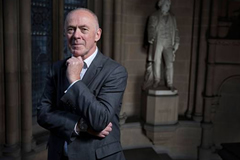 Downtown members were among a small group of business people invited to Manchester Town Hall this week to meet with city leader Sir Richard Leese to discuss the Devo Manc deal. He is an impressive character, Manchester’s head political honcho, who has masterminded his city regions development and growth masterfully in partnership with his chief executive Sir Howard Bernstein for over twenty years now. Indeed, he reminded his audience on Tuesday that though the Scottish referendum on independence had possibly accelerated the process of the devolution deal Manchester has secured, the city region had been working on winning such a package for many years now. Leese was clearly more interested in the additional powers and resources that this ‘settlement’ with Chancellor George Osborne and Westminster provides, rather than the establishment of a Metro Mayor, and he made it clear that only the creation of this post allowed Manchester to unlock the significant wave of new powers that were announced a fortnight ago. He conceded that other city regions would inevitably win more powers from Whitehall in the coming months and years, as the ‘English votes for English issues’ debate gathers momentum. But he warned that without a recognition that a directly elected figurehead was required to oversee these new powers, then other city regions will have to accept a diluted version of the Manchester deal. He was also quick to defend the potential challenge of a ‘two speed’ Northwest emerging, with Manchester clearly in the ‘box seat’ to attract and win not only extra government monies, but private sector investment too. It was up to the Liverpool’s and the Lancashire’s to get their act together and catch up. We had to go at the pace of the fastest and most advanced region he argued – and he is right. If Devo Manc doesn’t give the surrounding city and county regions the kick they need to focus on working in a cohesive and co-ordinated way, you have to wonder if anything ever will. Leese also expressed the view that for Manchester this is just the beginning. The city wants to make further progress on the devolution agenda, and that lobbying and campaigning process will be helped by having a directly elected figurehead at its helm. Exciting times for Manchester. Let’s make sure Lancashire and Liverpool are not left behind.